The inaugural face-to-face meeting between the Governing Board, the Council of Elders and the Senior Leadership Team was held in Washington, D.C. on 15-16 October 2016. During the meeting, the Council of Elders raised a concern that the Interim Moderator was not considered a member of the Council of Elders. According to the UFMCC Bylaws, the Moderator, whether elected by General Conference or elected by the Governing Board, shall be considered an Elder and a member of the Council of Elders. It was agreed that the Council of Elders should review the Bylaws and make a recommendation to the Governing Board. “[a]s the primary UFMCC spokesperson, an Elder, and the Chief Executive Officer, the Moderator is a voting member and moderates meetings of the Governing Board and of the Council of Elders; moderates General Conference; appoints Elders; and supervises UFMCC senior staff. The Moderator shall be responsible for leading the visioning process for the Fellowship, having a presence at global events, teaching and training, engaging in continuous learning, community relations, visitation and assistance in churches, ecumenical relations, and global social justice” (emphasis added). The duties of the Moderator cannot be altered without an amendment of this Bylaw by the General Conference. Consequently, a majority of the Council of Elders recommended this Bylaw be fully implemented. The Governing Board received this recommendation from the Council of Elders and has affirmed it. Further, the Governing Board wishes to clarify that during the initial process of establishing the job description for the Interim Moderator, the Governing Board did not consult the Council of Elders, not wanting to preclude any Elder from applying for the position. Therefore, the Governing Board did not have the input of the Council of Elders concerning the role of an Interim Moderator until the face-to-face meeting on 15-16 October. Based on these events, the Governing Board has set 8 January 2017, as the date for the installation of Reverend Elder Rachelle Brown as an Elder for the duration of the term of Interim Moderator. 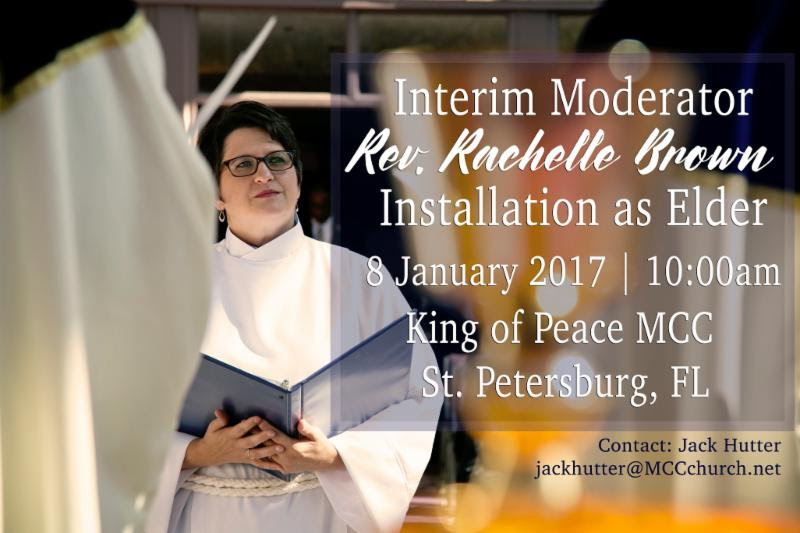 The installation will be held at King of Peace MCC in St. Petersburg, Florida, USA, at 10:00 a.m. Eastern Standard Time. The Governing Board and the Council of Elders warmly invite all of MCC, its affiliates, supporters, and friends to this celebratory installation service. In addition, the Governing Board affirms that the current Elders have agreed to serve through 2020. While the Bylaws authorize the Governing Board to fill a vacancy in the office of Moderator, the unique aspects of the role of Interim Moderator are not fully specified in the Bylaws. The Governing Board will review the Bylaws to address additional specifics for future Interim Moderators and bring recommended amendments to the 2019 General Conference. Questions concerning this joint letter can be directed to Reverend Joe Cobb, Clerk, at [email protected]. Blessings during this season of Advent; may God’s love continue giving strength and hope to our communities and the tenderness of Emanuel be with us always!